And goodness me, there are female highwaymen (highwaywomen?) in Boston! Four University students brought show girls as dates to the Saintz dance in Elks’ hall and were asked to leave. When it became known that the girls were from the “Mother Goose” chorus, currently appearing at the Walker, there was “indignant whispering,” and the Saintz were asked to oust the offending couples. “It fell to Chancey Finfrock to extend the invitation to the octette to do the vanishing act, which he did with as much gallantry as the circumstances would permit.” Saintz club members admit that the chorus girls were well mannered and did nothing objectionable while in the hall. Elsie Slade is missing again, a colored chiropodist wept “great scalding, briny tears” over his arrest, a housewife whipped an impudent tramp, and a Missouri girl played piano while her school burned to the ground. Mlle. Spellman and her educated bears will be the Waker [sic] feature for Monday—this is some act for it has played before the crowds at the New York Hippodrome. Big bears and little bears, but all of them trained marvelously are put through difficult and amusing paces. The intelligent bears head a bill which includes Nadell and Kane, comedians; Nealis and Hopkins, “The Postman and the Maid,” and Ah Ling Foo, the Chink magician. Final performances tonight of Nan Halperin and her “Suffragettes,” an amusing musical show featured by Nan herself—she is a comedienne of originality and her imitations of “vodvil” are worth a trip to the Walker. The new comic act at the Walker Theater is a “militant English suffragette” armed with a huge mallet, who sings a song and makes a speech. Also at the Walker is “The Village Lockup” (a sketch of rural life), the minstrels Moore and Browning, and the Kuma Japs. Apparently there was a student riot at the opera house following the Illini football win, but the front page of Papa’s Daily Illini is missing today. I imagine there will be something in the Courier-Herald tomorrow about the riot. 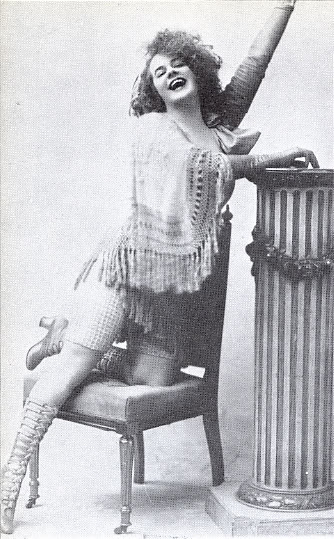 I’ve just heard a wonderful radio program about Eva Tanguay, who was a sort of rock star before there was rock music. The show is an interview with Andrew Erdman, who recently published a biography of the diva. Highlights include a horribly scratchy 1922 recording of her voice, singer Bree Benton “channeling her inner Eva Tanguay” on a few songs, and finding out how Eva once jabbed John Philip Sousa in the buttocks with a large hatpin. Apparently our Urbana aldermen are not so good at baseball as they said. They lost 23 to 9 to Champaign. BUD MARS THE AVIATOR IS BADLY INJURED—terrible news! He was just here for the county fair, but some horrid fence in New York has got the best of him. The Walker opera house will open its vaudeville season Monday night. The opening bill consists of the Marimba band; Harry Thompson, “a clever comedian and fun maker”; Wolf and Zadella, two old favorites; and Miss LaBelle Clark, with her wonderfully trained dancing horse. “The General Films company of Chicago will furnish the motion pictures this year, this fact alone assures us that the pictures will be the best.” I should very much like to see a dancing horse.